WHAT COULD BE MORE SIMPLE? The SUPREME BREATH™ CONFIDENCE PUMP BOTTLE fits in a pocket or a purse and can take care of all treatments you may need during the day. The SUPREME BREATH™ CONFIDENCE PUMP BOTTLE fits in a pocket or a purse and is so versatile, it can take care of all treatments you may choose to do during the day. A quick-spray touch-up: 2-3 squirts; swish and you’re good to go. Mouthwash: 6-8-10 full squirts, enough to be used for a complete treatment; swish for at least 30 seconds preferably 2 minutes; spit out. Kills the bacteria and odor-causing molecules for many hours, even up to a full day. Toothpaste: Spray 3-4 squirts in your mouth and use your toothbrush to brush normally; because the mouthwash does not have the thicker consistency of the toothpaste, I personally use 2-3 squirts for my upper teeth and then squirt again for my lower teeth. Gauze. 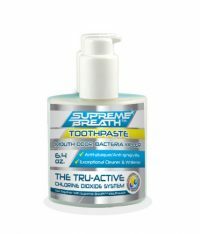 Those familiar with the two major protocols in the book Beating Bad Breath-THE CURE! know that mouthwash on the gauze will remove more coating, bacteria, and odor from the tongue than a toothbrush or tongue scraper. 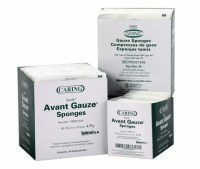 After saturating 3-4 gauze, move the gauze between your fingers for 30-60 seconds to mix the solutions. Then use the gauze to treat your tongue and teeth – 3 times to aggressively wipe your tongue and its coating, and once to wipe all your teeth and gums. For those who have had the CURE, the Confidence Pump Bottle will give you that extra burst of confidence and allow you to use any part of the Maintenance Program during the day. For those who are following the Beating Bad Breath Protocol, the Confidence Pump Bottle allows you to follow the daytime part of the Protocol easily and conveniently. It works in every situation and that is why I call it the CONFIDENCE PUMP BOTTLE! 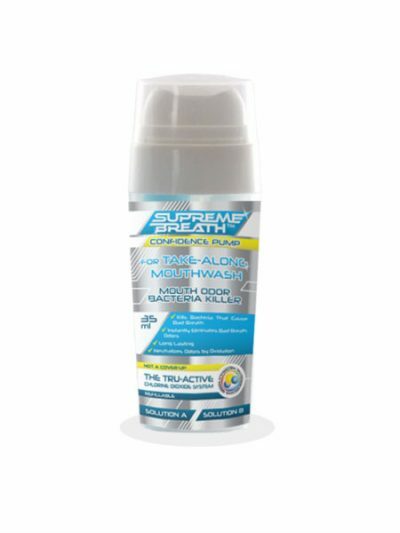 Note that the Supreme Breath Confidence Pump Bottle is sold unfilled. Instructions for filling are included in the package. The Confidence Pump Bottle is also part of the Supreme Breath™ Confidence Kit for TOTAL CONTROL.